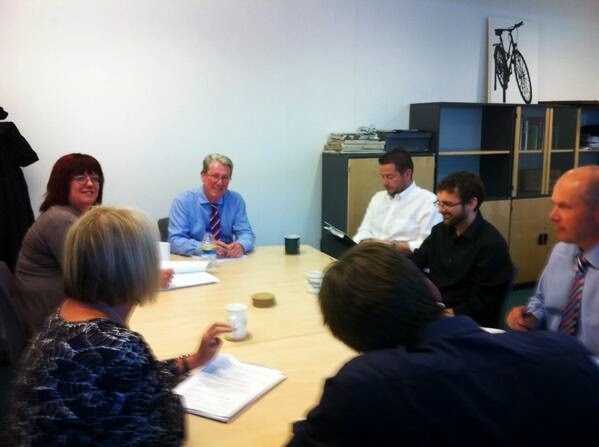 Guernsey Press editor Richard Digard ran his last news conference today. Richard, who has edited the Press for almost 15 years, is taking early retirement at the tender age of 60. His has been a colourful career. He has never been one to shy away from controversy and, as a result, has had death threats, cat poo through the letterbox of his home and a legal action which tried to relieve him of his house. Once, after he had written a typically sparky column about boy racers, a procession of 50 cars drove slowly past his house, the young drivers all looking resolutely ahead. He has, though, taken all of this in his stride and certainly makes no apology for rocking the boat. And he was still at it, even to the last. In his valedictory column last Friday, headlined Pain in the proverbial? Someone had to be, he took yet another swipe at the island's government. He wrote: “I’ll let you into a secret. Guernsey's system of government is very poor. Actually, mind-numbingly bad. It doesn't mean to be and there are some pockets of goodness and occasional flashes of excellence or even brilliance. But taken as a whole it consistently lets down the island.” No mellowing with age I see. 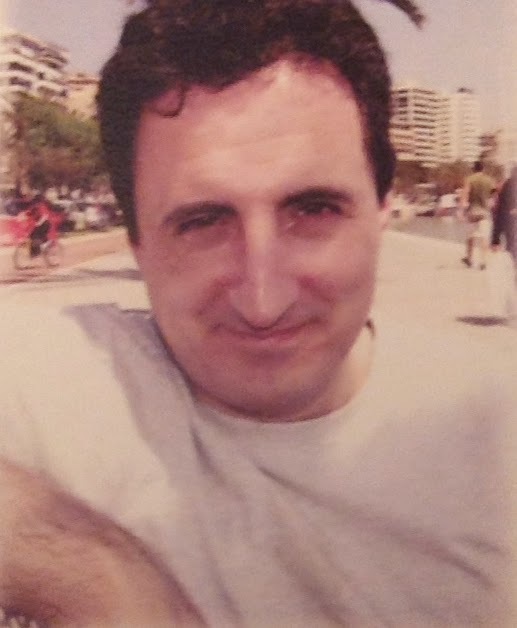 Richard’s paper was always a campaigning one - ranging from a Shop a Yob feature, which resulted in several arrests, to raising cash for an Alzheimer’s care home. But it is as a thorn in the side of inefficient politicians and officials that he will be best remembered. The Press has also kept its sale really well under his editorship. In 1996 it was selling 15,847 - today it sells around 14,000. Given what has happened to daily newspapers elsewhere, it is a remarkable performance. There are many reasons for this ... but one of them is that the Press has remained relevant, newsy, top quality and has been prepared to reinvent itself. Despite his prickly professional persona, Richard is one of the good guys of newspapers. I first met him 17 years ago when he was deputy editor. 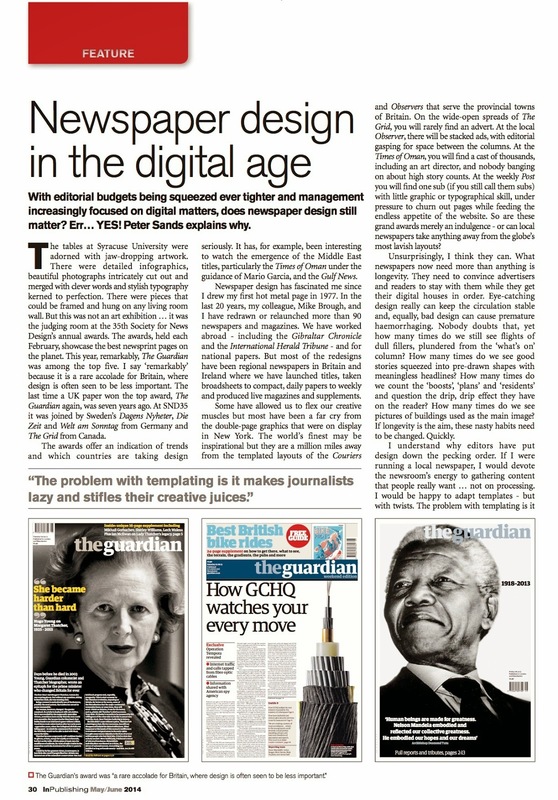 Since then I have helped redesign the paper twice (taking it from broadsheet to compact in 1999), run the journalists' training scheme and assisted with the restructuring of the newsroom. It has been a joy - one of my favourite places to visit. Richard and his team have always been massively hospitable and I have enjoyed many a pint (and the odd glass of Sancerre) with him in the Ship and Crown in St Peter Port. The new editor will be announced in the Press on Monday. Richard and his wife Di, the paper's features editor, will be having a few farewell drinks next week. My flight is already booked. Does your newspaper look as dull as ditchwater? • Flights of dull fillers, plundered from the ‘what’s on’ column? • Headlines with blands words such as ‘boosts’, ‘plans’ and ‘residents’. • Pictures of buildings as the main image. • Citizen journalism that has led to pages of landscape pictures. I like contributed stories and photographs - but am often not keen on the execution. Newspapers are about people, not sunsets and trees. If the readers want flowers, they can pick up a bulb catalogue. • Templating that has been misunderstood and has led to two-deck headline syndrome. It has made some journalists lazy and stifled their creative juices. • Body copy set in 8pt Times, which is just about unreadable. If longevity is the aim, these nasty habits need to be changed. Quickly. Good design can keep the sale stable but, more importantly, poor design is guaranteed to cause premature haemorrhaging. Some regional newspapers are excellent of course. I was massively impressed with the front pages and the design shortlists at last week’s Regional Press Awards. But there are still too many that look boring - and in today’s newspaper world, boring is the biggest sin. 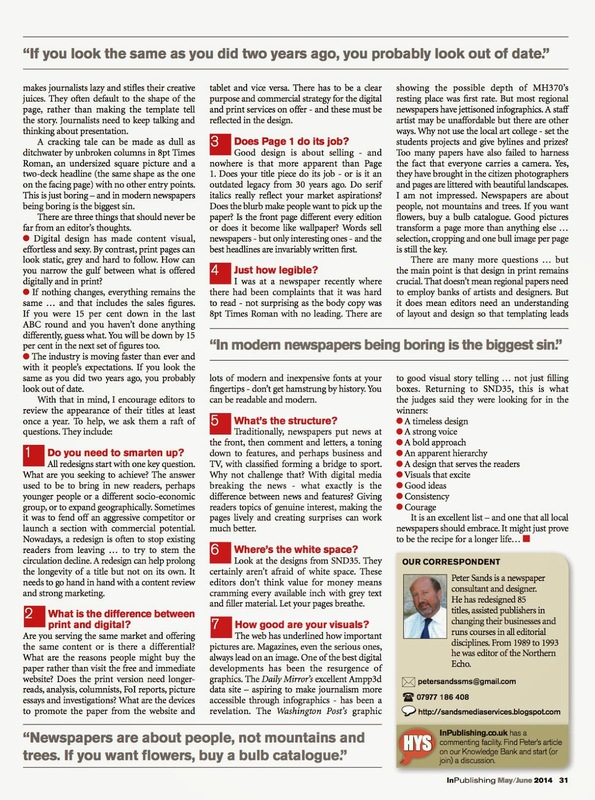 If you recognise any of these traits, you may want to take a look at my tips on how to make your paper look better, which is in this month’s InPublishing magazine. Take a look here. I have now recovered from a cracking day at the Regional Press Awards yesterday. It is the first time I have attended the awards since I stood down as Chairman of the Judges in 2011. I am delighted to say they are in good hands with the Society of Editors. Well done to Bob Satchwell, Paul Horrocks, Sue Ryan and all. From a personal point of view it was a real pleasure to catch up with (increasingly) old faces and enjoy a glass or two in the sunshine afterwards. It was particularly nice to have a pint with Shamus Donald, MD at the Oxford Mail, who was instrumental in bringing about my deal to buy the Westminster Press Training business 19 years ago. I guess I owe him more than just a drink. The breakdown of winners was reasonably spread across the industry. If we include the Journalists’ Charity Award, the Chairman’s Award and the Making a Difference Award, there were 26 ‘Oscars’ in all, with Local World taking pole position. Well done to all the winners, the highly commended and everyone who was nominated. It is a great achievement, just to be shortlisted There was probably no better way to spend a sunny spring Friday afternoon - especially as it was my birthday. Here are my musings on the day. i) Presenter Nick Ferrari is a gem. He understands the business, he goes off script, he is irreverent but respectful and very funny. He just gets the tone spot on. I was going to say he is real value for money ... but he actually donates his services for free. ii) As Ferrari observed, the Regional Press Awards have a very different atmosphere to the national awards. At the national bash you have tabloid v tabloid, tabloid v broadsheet, papers as polarised as the Daily Mail and The Guardian and some personal rivalries too. Who can forget the fisticuffs between Piers Morgan and Jeremy Clarkson? And I well remember the diplomacy required at the 2011 event when The Guardian was shortlisted for Scoop of the Year for exposing the phone hacking scandal at the News of the World. 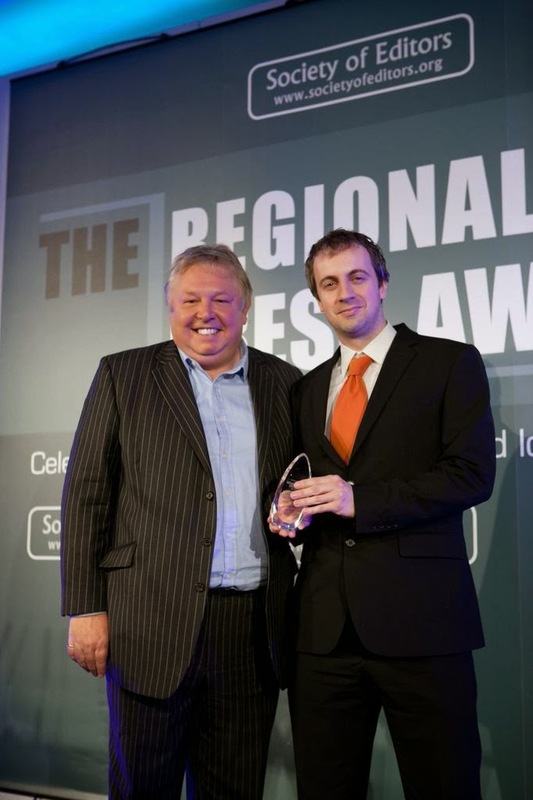 At the regional awards there are no such rivalries and few geographical head to heads. Instead the room is full of passionate and talented people facing the same challenges. It really is an event where people from different newspapers genuinely respect and like each other. The Venerable David Meara, who is retiring in July as Rector of St Bride's after 14 years. St Bride’s has long been the spiritual home of journalism and under David’s tenure the links have been strengthened. It was good to see that recognised yesterday. 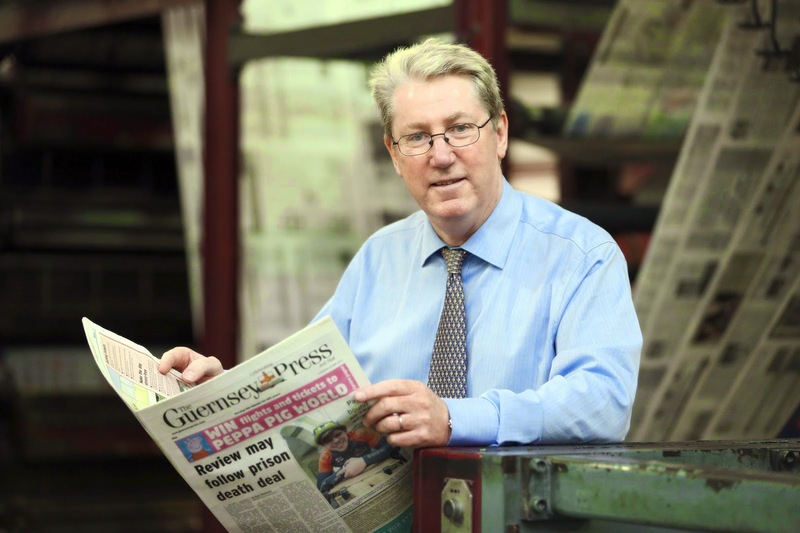 Deric Henderson, PA’s Northern Ireland editor who is retiring after 45 years as a journalist. Deric has covered every major terrorist-related incident and political development since the troubles began in 1968. There is an excellent BBC interview with him here. Peter Barron, who has been editor of The Northern Echo for 15 years. 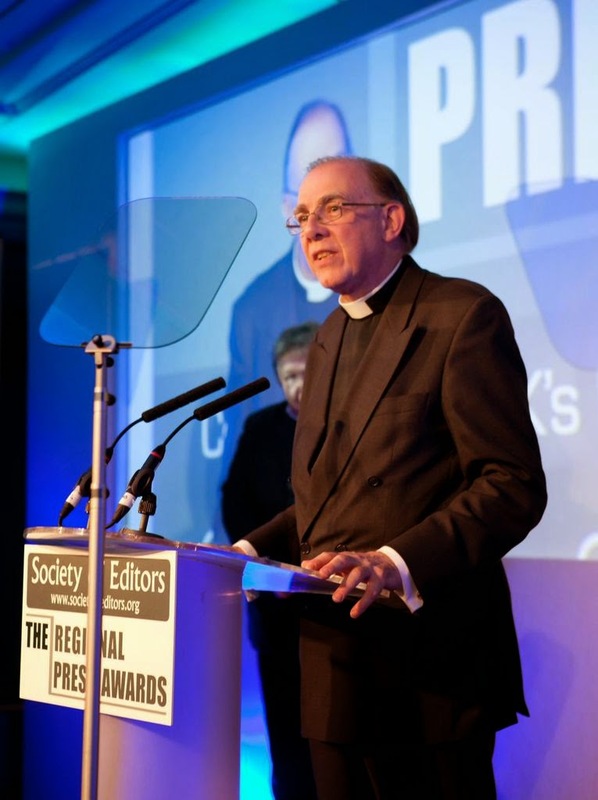 He was presented with the Journalists' Charity Award for an outstanding contribution to journalism. Peter has achieved many things - Deputy Lord Lieutenant of Durham, an MBE, successful author, fundraiser and ambassador of a children’s hospice. But it was for the Echo's remarkable campaigning track record that this award was presented. Great recognition for three very different, but richly deserving, people. iv) Peter was, though, responsible for the worst joke of the day. Receiving his award he said: "It’s been a privilege for me to edit The Northern Echo, a great paper with great traditions and some great editors. Harold Evans, of course; William Stead who died on the Titanic; William Stead’s predecessor, Peter Sands." Ha bloody ha! I ask you, is that any way for a Deputy Lord Lieutenant to behave? You can watch him here. v) A far more gracious acceptance speech came from the Lincolnshire Echo’s excellent photographer Anna Draper. While others prudently thanked their editors and news-editors, and even their MDs, she thanked the families of people who allowed her take deeply personal pictures. She said: “I'd really like to say thank you to the families who let us in. 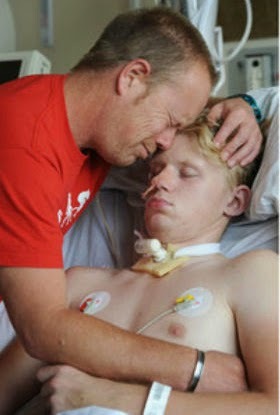 I took a photograph of this boy (Ryan Smith) who was in a coma and they didn’t know what was going to happen to him and that family was brave enough to let people like us to go and take photographs and tell their stories." You can watch her here and check on Ryan’s progress here. 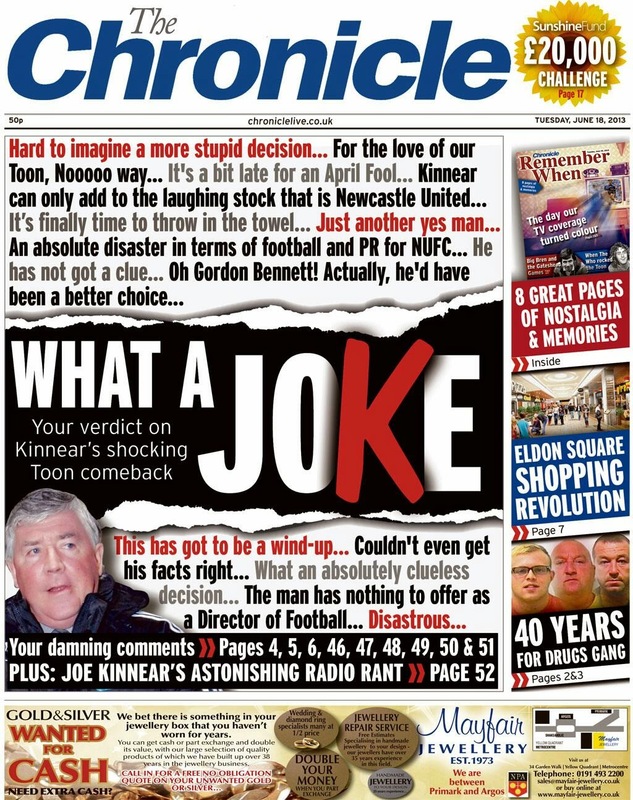 vi) There seems to be no escaping him in my life these days - but even Newcastle United owner Mike Ashley got a mention. The Evening Chronicle has produced some excellent front pages on the mess that is Newcastle United and they led to Gary Beckwith winning designer of the year. Gary publicly thanked Ashley for providing his paper with some amazing stories. I have been struggling to think of Ashley qualities I admire but at last I have found one ... being the inspiration for great newspaper design. You can watch Gary's wine-fuelled acceptance speech here. vii) The table collections raised £1,727,68 for the Journalists’ Charity. Table 4 - a Trinity Mirror table - raised the most. Well done. The charity is something all journalists need to support. The details are here. vii) The awards were a fitting swansong for outgoing Brentwood Gazette editor Neville Wilson. His paper won Weekly Newspaper of the Year (Under 20,000) for the second year in a row. I can’t say I’m surprised. I had the privilege to work with Nev during my Northcliffe stint and his paper bristled with ideas, always brilliantly executed. He is off to join the Local World corporate team in London. Kensington’s gain will be Brentwood’s loss. viii) There are the same names that come round year after year, proving that the judging process works and that real talent is recognised, whoever the judges might be. This year’s shortlists included many familiar names and previous winners including the Basildon Echo's Jon Austin, Sunday Life’s Ciaran Barnes, the Derby Telegraph’s Robin Johnston, the North Devon Journal’s David Powell, the Craven Herald’s Stephen Garnett, The Northern Echo’s Stuart Boulton, the Croydon Advertiser’s Gareth Davies and the Leicester Mercury’s Lee Marlow. Few, though, can boast the record held by Jon Colman of the News & Star and Cumberland News. He has been on the shortlist for either weekly or daily/Sunday sports reporter every year since 2006. He was weekly winner in 2006, 2007 and 2008. In 2009 he won both the weekly and daily award. In 2010 he won the daily award, as he did yesterday. Cumbrian Newspapers non-exec director Charlie Burgess tweeted later that 'Jon Colman says he'd give the award back in return for the three points that would have saved Carlisle from relegation.’ That is undoubtedly true. ix) Jon Colman’s award was just one of four for Cumbrian Newspapers. They included Weekly Newspaper of the year (above 20,000) and Daily/Sunday Newspaper of the year (below 25,000). They also won a highly competitive Front Page of the Year award for an excellent montage by the North West Mail. The group is no stranger to these awards. The Cumberland News retained its title from last year and the News & Star also won the award in 2010. CN, headed up by Robin Burgess, is a relatively small independent newspaper group based in the far North which consistently punches above its weight. Independent and locally-owned newspapers … now there’s an idea. x) The Lancaster London Hotel was an ideal venue - the food was first rate and the wine flowed. The Victoria pub around the corner was also just the spot to catch up with old friends with beer and sunshine. The day was a celebration of everything that is still great about the regional Press and its people. Congratulations to everyone involved - and long may they continue. 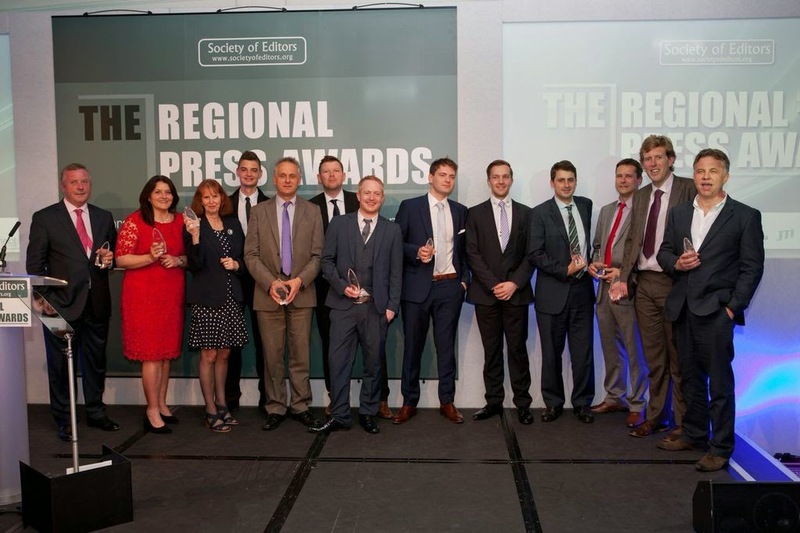 The full list of winners, highly commended and videos of the event can be found on the Regional Press Awards website. 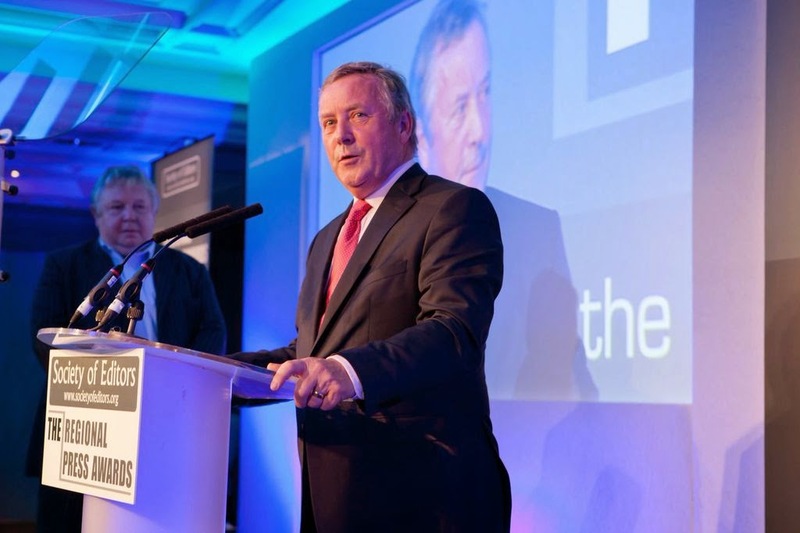 All pictures taken at the awards are by Nick Carter, MagStar Ltd. 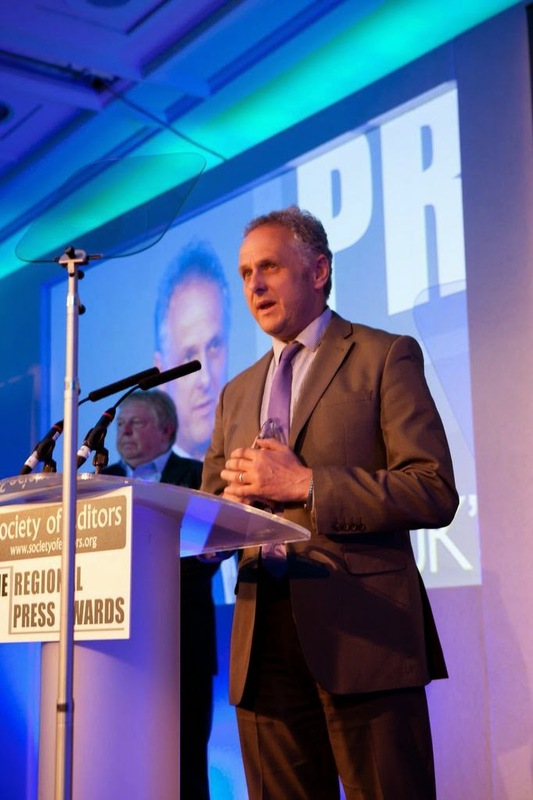 I am looking forward to the Regional Press Awards next Friday ... a very rare chance to find so many colleagues and friends in the same place at the same time. One of my favourite awards is always the Front Page of the Year. Here are the pages on this year's shortlist. 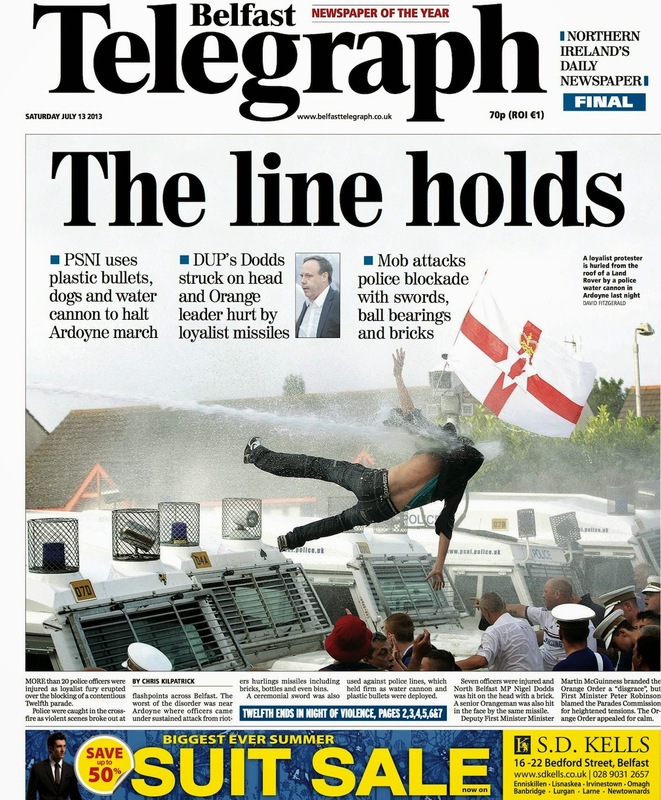 The Belfast Telegraph uses a cracking picture taken during the loyalist protests last summer. The Courier in Dundee goes for a wraparound with a really tight crop to celebrate Andy Murray winning Wimbledon. 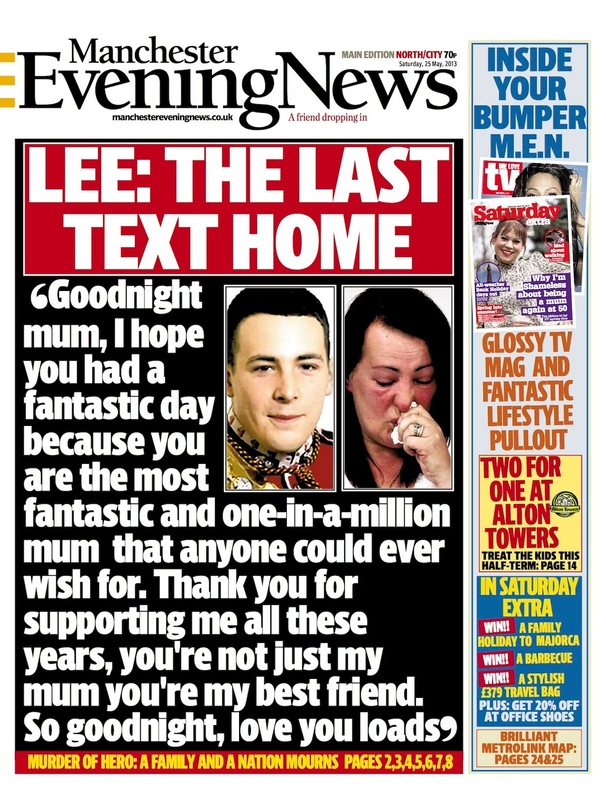 The Manchester Evening News wipes out Page 1 with the last text that Lee Rigby sent home before he was butchered on the streets of London. 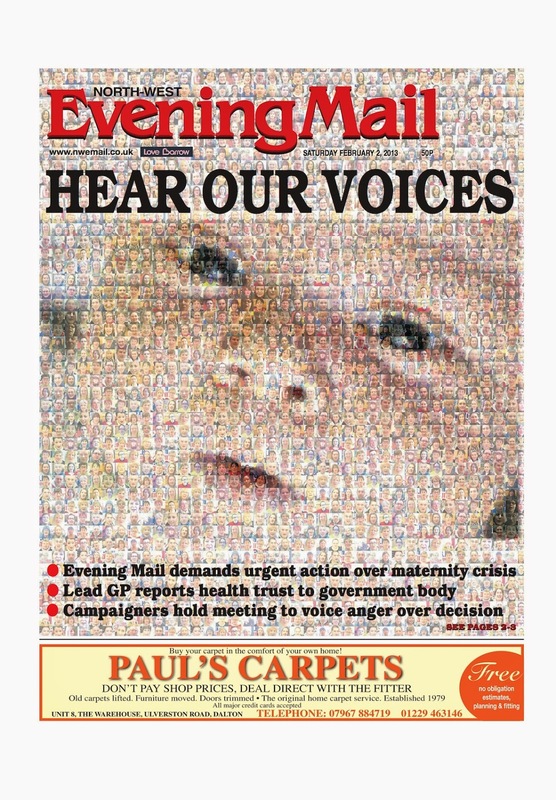 The North West Mail uses a mosaic of 1,200 local faces to create the picture of a baby to illustrate its campaign to keep a maternity hospital open. 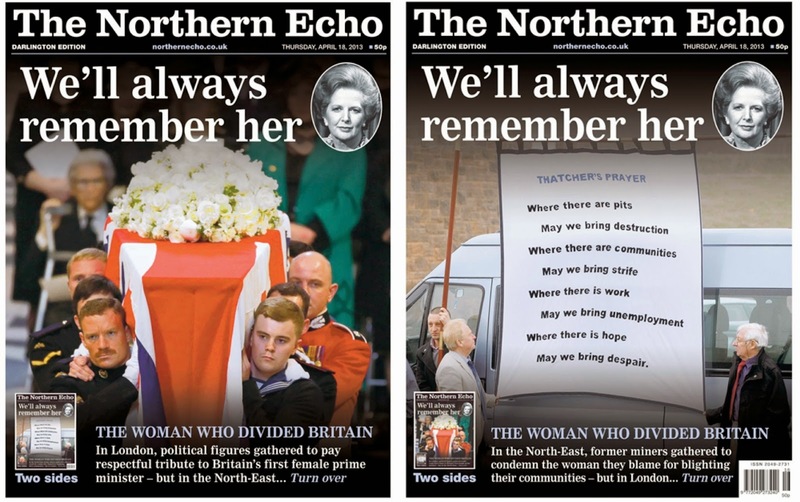 The Northern Echo offers readers alternative front pages for the funeral of Margaret Thatcher. One shows tributes in London, the other former North-East miners condemning the woman they blame for blighting their communities. Both were on display and readers could choose. 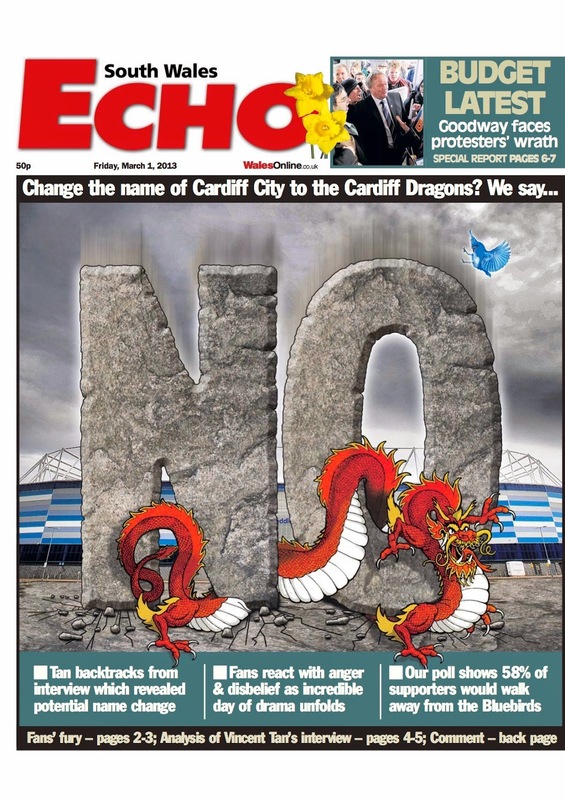 The South Wales Echo runs a strong illustration expressing its view of the plans to change Cardiff City's name to the Cardiff Dragons. Six very powerful pages that illustrate the creativity and passion that is prevalent in the regional Press. I certainly wouldn't like to pick one over the others. Who will win? All will be revealed next Friday. Hopefully, I will see some of you there. The funeral on Monday of 50-year-old John Killeen, at the picturesque crematorium in Barham, below Canterbury, was low-key but touching. We knew this was our quiet and modest friend's preferred way - absolutely nothing ostentatious. His wife Theresa, who'd been John's life for 25 years - and he hers - had planned it perfectly. It's just over four years since John was diagnosed with myeloma, the incurable blood plasma cancer. This came three years after he resigned his group editorship of the Hendon Times, moved to Folkestone, and into scriptwriting and short story writing - and for both he won critical success. He had certainly attained success as a journalist. He rose from Hastings trainee to group editor of the Hendon and Finchley Times, Edgware and Mill Hill Times, Barnet and Potters Bar, Borehamwood and the Harrow Times. How ironic, then, that in 1987 after I painstakingly selected five young hopefuls, including John, for our Westminster Press training course in Hastings, our MD tried to ban him from joining our papers. I had decided that, when a senior journalist left, I'd replace with a trainee. Or two trainees because they wouldn't break my budget. The MD, Tony Greenan, was known for being tough and irascible and realised my two-for-one-ers would hurt the budget when they became seniors. But he was prepared to try it. A month later I told him I wanted five trainees. My pitch was that I'd make sure all were talented, keen - and they'd stay longer than seniors, who kept nipping off to Fleet Street. Amazingly, he agreed. I joked that two-and-a-half seniors would have left by the time my five returned from the 20-week course. He didn't laugh. In agreeing, however, he stipulated all five had to be local. I soon found my five. Four were local but one was a Dublin graduate recently over from Ireland. I looked again at the other locals. Two or three were good, but John was better. So I gave him a contract. I had broken a clear undertaking and should have discussed it with the MD. But everything was a rush. I told the five they would receive training contracts and, if they passed their exams, a job. Ballistic's the word. He roasted me. I was trying to say I'd done what was best for the Hendon Times - but I doubt he heard. I could hear the phone being banged around as he emphasised points. Then he paused. I tried to hear what his secretary was saying. It might have been 'Problem in the works.' The receiver slammed down. Temporary respite. For how long? Well, luckily for me, there the matter lay. I think he finally accepted I was right. If so, I wish he'd told me. I'd have slept better. A year on, John was producing great stories. I was often called into Tony’s office for a chat. These could be pleasant, as he possessed humour and charm, and during one session, he said: "Your Irish fella (Tony was Irish himself) he's doing quite well isn't he?" I thought that was decent of him. John soon became chief reporter of the Edgware and Mill Hill edition. Reporters respected him, and so did his district editor. He helped run the office and continued to find strong stories. Then a note went out from WP training guru, Bob James. Could any editor spare a senior to help the Hastings course? I thought JK would be good at that - and it would be good for him. It was great experience. He was good for the trainees and he learnt from other lecturers. When he returned, he trained as a sub and page designer and became one of the best. Later he was appointed assistant editor. Modest about his own achievements, frequently chucking wry observations around the Hendon newsroom, he was a friend of all the staff - a trusted adviser, excellent sub and page designer. He never lost his rag and was great on IT and legal matters. 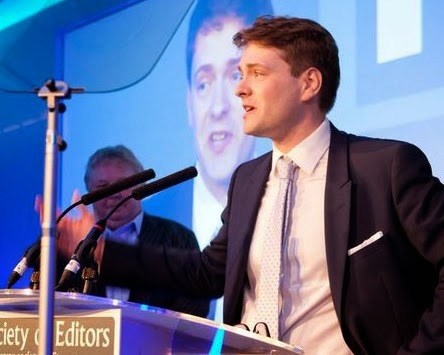 He was the staff's rock, and in the world of journalism and the shambolic nature of news gathering, production crises and instant web demands, that's a superb compliment. John was appointed deputy group editor and, when I took early retirement in 1999, I recommended that John took my place. Chairman Jim Brown and chief executive Paul Davidson agreed. After leaving, I'd call in, read through an edition or two - and feel so proud that the paper was in good hands. All of this is about a tremendous guy's achievements as a journalist. But he and Theresa had another magnificent achievement: coping with his cancer. John's colleague-in-crime Martin Oldaker, former editor-in-chief of East London Guardian series, and I visited him and Theresa about three months ago. All four of us spent a day laughing, so much uproarious laughter, at the fun we managed to find and the scrapes we got into. There was no sign of what John, and consequently Theresa, endured. Keeping the cancer at bay involved relentless chemotherapy, and then six or seven weeks at a time in hospital isolation after plasma transplants, and so much more that I do not know. This continued until he was taken to hospital and died of pneumonia on April 11. I would like to show you a note John sent to close friends soon after being handed the devastating shock while in hospital with damaged vertebrae. "....and to cut a long story short, I was diagnosed with cancer. To be specific, myeloma (cancer of the blood plasma) which attacks bones, hence the back pain. Not a common disease. Exceedingly rare in the under 50s. No known cause. Just one of life's short straws. Bad news: It's cancer. Obviously. No known cure. Good news: If you're going to get cancer, it's one of the better cancers to get. Quite "treatable". Current prognosis is 5-10 years and improving in recent years. This all happened last month. I spent ten days in hospital while they rescued my kidneys (apparently I had acute renal failure - a side-effect of the cancer) and started radiotherapy and chemo. Now I’m at home and I'll be taking chemo for about four months. The good thing is that it's all tablets that I can take at home and the side effects are fairly mild. Strangely, very strangely, I have had no huge emotional reaction to this yet. It's not that I'm trying to be brave or anything, it's just I don’t feel any anger, or fear, or anything much. At the moment, it just is what it is. Maybe it's the five to ten year thing. That feels like a long time. When the doctor gave the prognosis Theresa burst into tears and I (inwardly) smiled, thinking 'I'll take that, thanks very much'. Once you become a member of the 'unwell' your perspective changes, I guess."